Just after I wrote the last blog post, some friends came to visit me in Sarnano and I thought perhaps it might be the ideal opportunity to combine their desire to see the Lame Rosse (the cool rock formation I wrote about in the last blog installment) with something new I was keen to see, the Gole di Fiastrone (literally “throats of the Fiastrone” referring to the river and the formation of it). 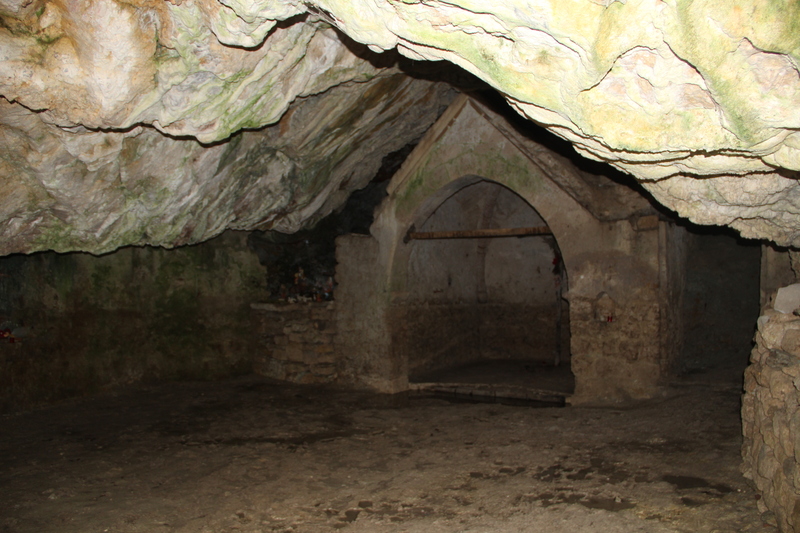 I dug out my map and found a route that would take in those two features but also another sight: the Grotto dei Frati. 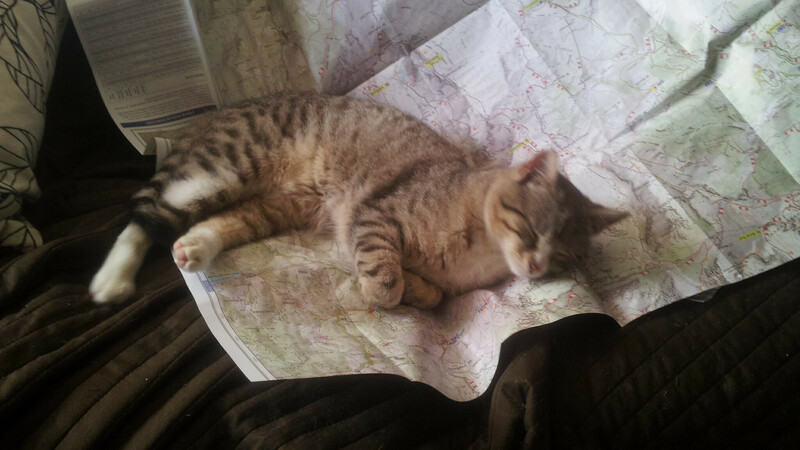 I estimated it would probably take about 6 hours which isn’t bad really – we’re all fairly fit and enjoy walking. It was indeed 6 hours but half of that was up a near vertical slope! I enjoy walking but I’m not cut out for climbing!!! So, it goes down as the hardest walk I’ve ever done but I’m very glad we did it. About midway through we came across a sign that said the trail was for “expert hikers”. I felt proud and stupid all at the same time! The Fiastrone riverbed. 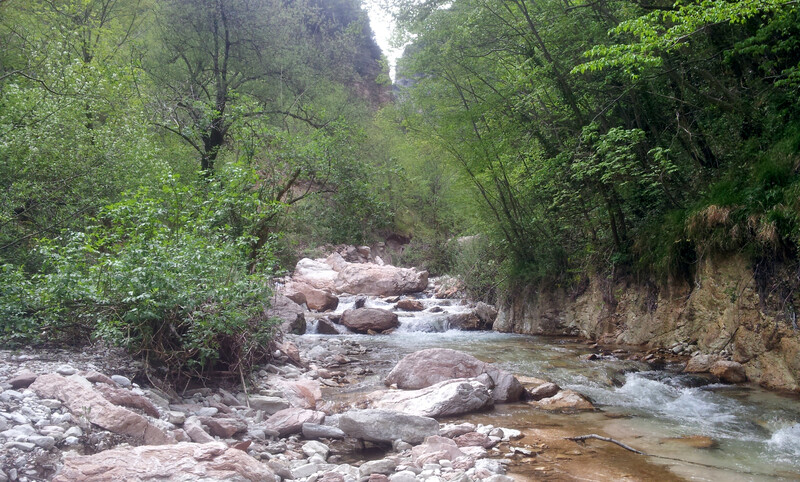 To continue the walk to the Lame Rosse we needed to cross this river. I did attempt it – I took off my boots and waded into the river and about 2 feet in, I wimped out and came back. It’s cold and slippery. We sat looking mournfully across the other side of the river eating our lunch and were fortunate enough to come across some people coming from the other side of the river wanting to get to our side. We watched as they made their way precariously across the river on some broken tree branches and debris. None of them died so them having set a precedent, we followed shortly thereafter. In fact, one of our members actually braved walking across the river wielding his dog. 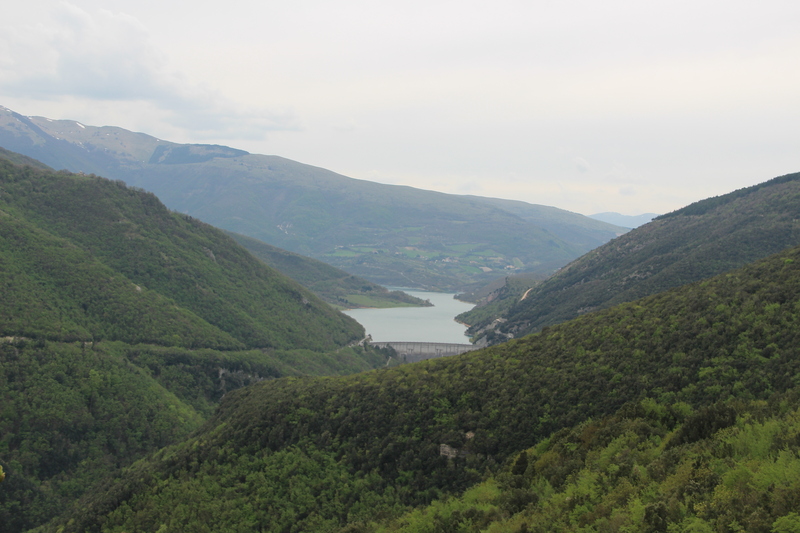 This was taken on the way down from to Lago di Fiastra. You can see the dam at the bottom of the river. That’s where one of our cars was parked, a depressingly long distance away and that was about 4.5 hours into the walk! This is part of the Grotto dei Frati, a little area cut into the rock face that still seems to be used for religious ceremonies. 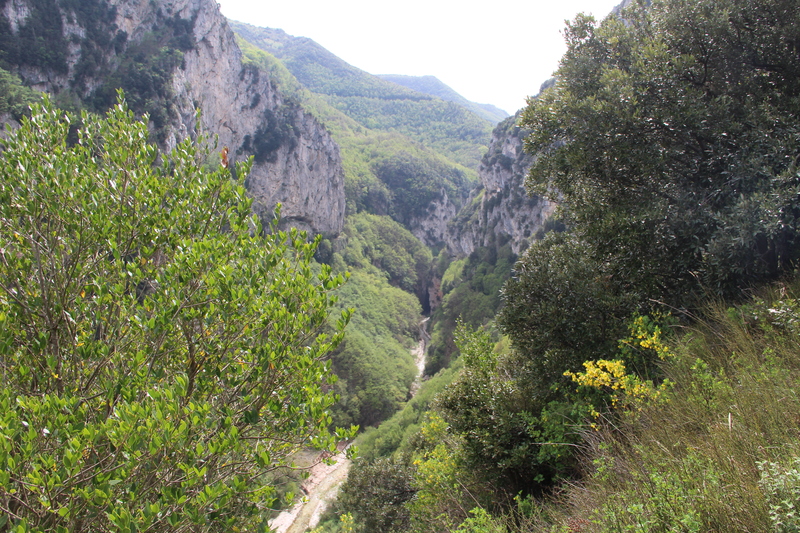 And from the Grotto dei Frati, you can see the Gole di Fiastrone (where the river meets the rock about the center of the photo). To get there I think we’d have had to have waded up the river. Definitely more of a summer activity!!!! 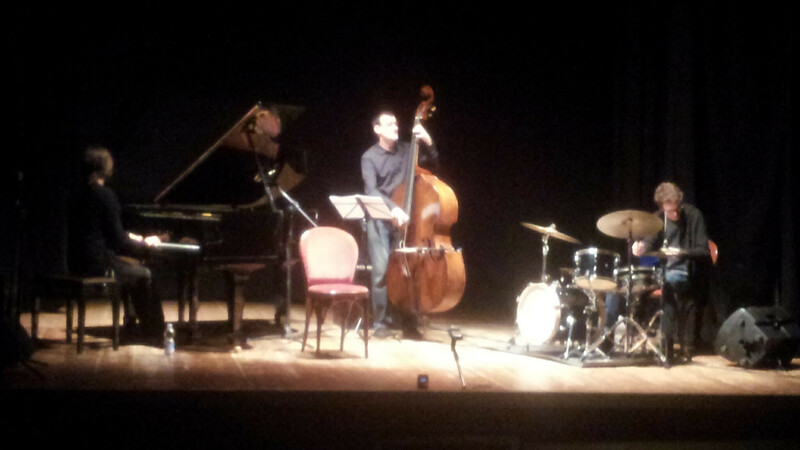 The following day I went to Forli with another friend to seen an exhibition of the wonderful Giovanni Boldini. He does some amazing portraits and it inspired me to get back into trying to get good at drawing portraits again. 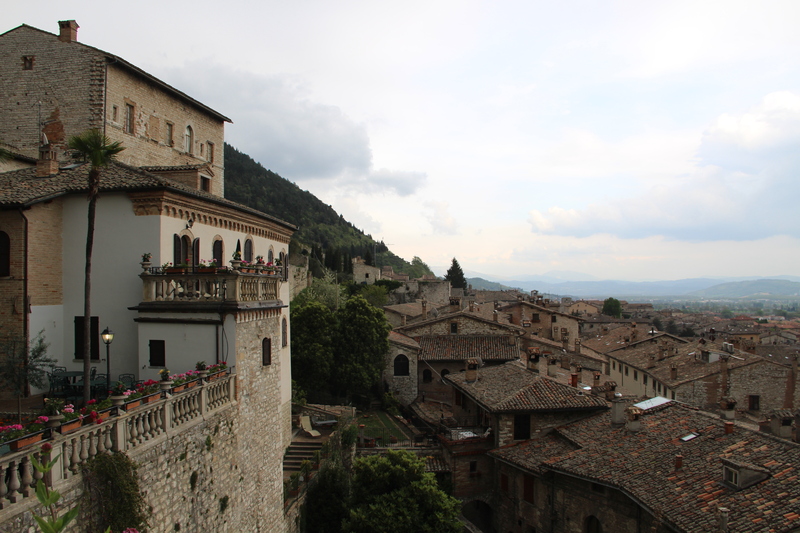 The day ended up taking us on quite a road trip and we stopped off at Citta’ di Castello and then Gubbio in Umbria. A sculpture with her breasts out in what seems to be a type of courtroom – an effective way to appease a jury no doubt. 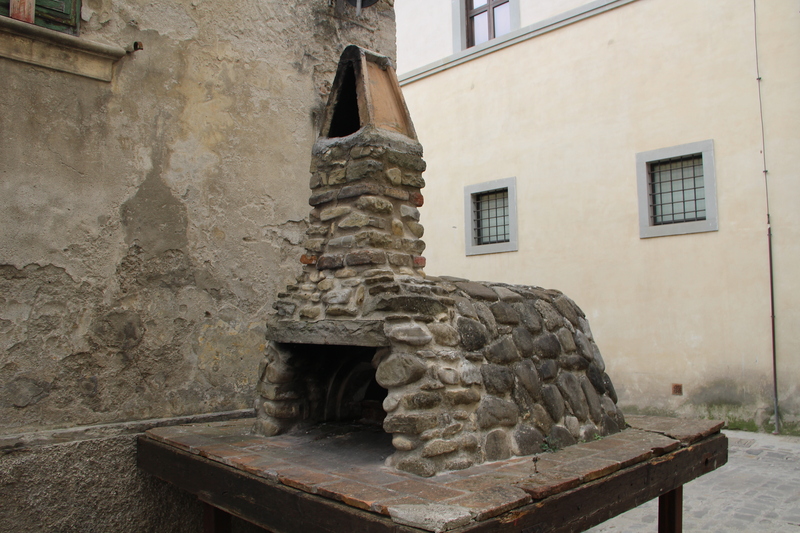 Little church dedicated to baking pizzas in Citta’ di Castello. Cutie pigeons taking in the scenery around Citta’ di Castello. 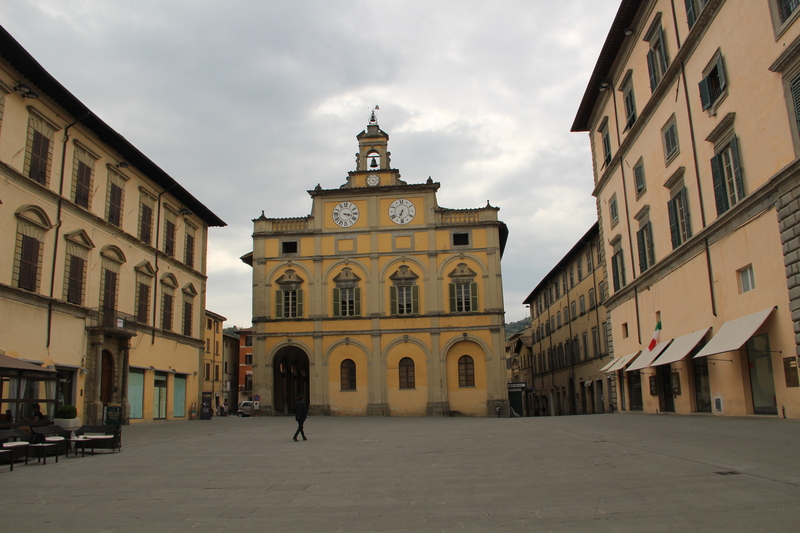 Citta’ di Castello – it’s a walled town, as many of them are but this one seems much more intact. 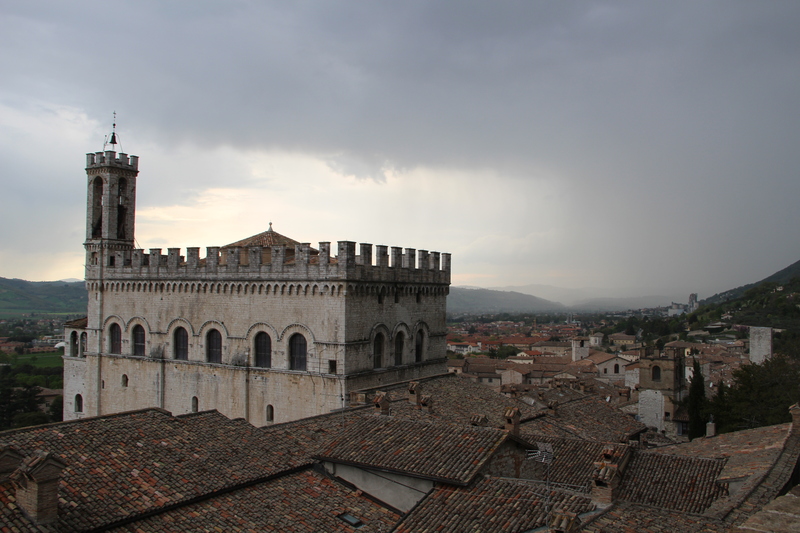 Gubbio again with the rains approaching! I finished my Science of Happiness Online Course last week which I started earlier this year. It’s free, online and you can do it in your own time. It’s my first online course and I hadn’t realised there was such a wide variety to chose from. I went for this one because it appeals to my interest in psychological things and well, I think I’m pretty happy but there’s no harm in looking to see if there’s something else that could make me happier eh? I made pitta breads – they taste exactly like pitta breads! I’m reasonably impressed with myself! (They don’t have pitta breads in Italy as far as I can work out). And…. 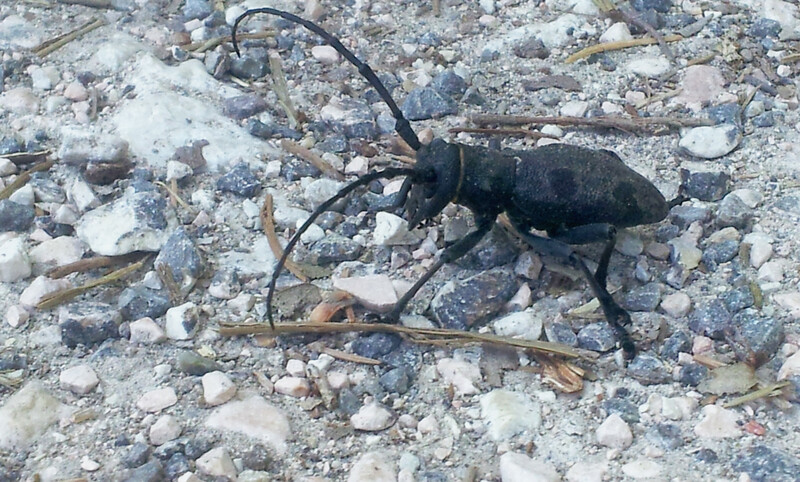 I came across this bug… It was almost exactly the same size as my car. I’ve decided to call him Megabug. 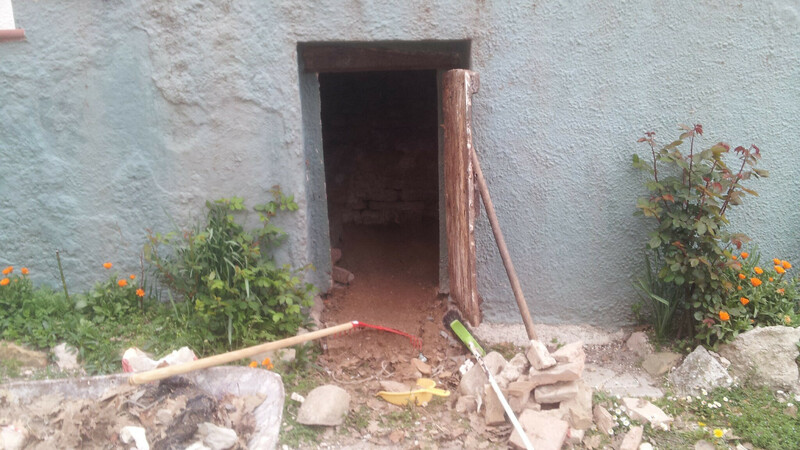 And….I cleaned out the Snake Pit under the house – this photo was taken part way through. There were actually no snakes in it very much to my relief. I took a golf club down there just in case. And…. I went to a jazz concert at the local theatre with a friend which was a mix between really very good and very bad (this latter review is not an indictment on the musicians, who were brilliant, but instead, my ability to retain interest when listening to the more “unstructured” jazz pieces). I was definitely impressed by the good bits though and I have resolved to find some good jazz tracks to get into. 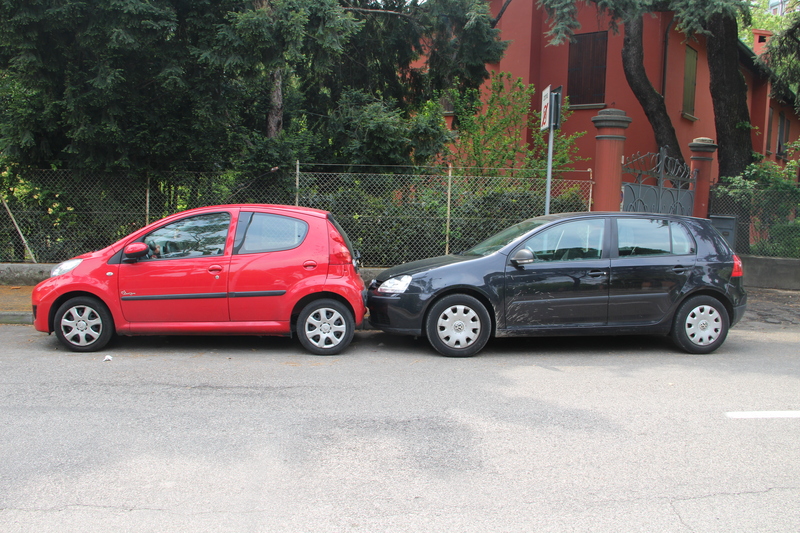 And….. following on from my recent “Driving Guide”, this photo was taken in Forli and nicely demonstrates the appropriate distance between parked cars when parking in Italy. And…. 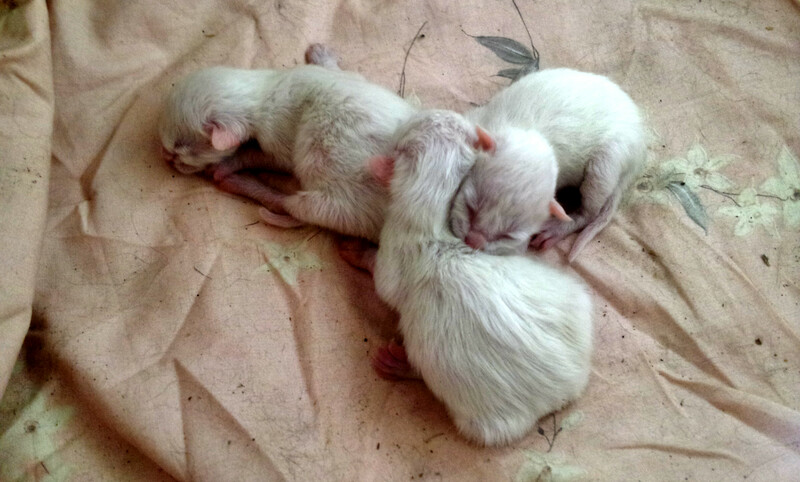 finally on the photo front – we’ve got kittens in the neighbourhood! These belong to Batfink’s aunty and father (who are we to judge?). There are another three (true brothers and sisters to Batfink) too. I want them all. I think that’s it for the photo journalism! I hope everyone is having a good week. I hope Batfink finds a safer route when we come over! Hiya, we were talking last night, saying that we should get out there again! Look forward to it, will bring a compass and my garmin in case! Quite fancy getting down to Puglia as well. For some reason I’m not getting any notifications through so didn’t see this! Come between the 20th June and 13th July (visitors!) Otherwise I’m back in the UK for a while 😦 That said, I could leave you the keys so you’re always welcome whenever but I want to show you the nicest places! Hi Sue, glad you didn’t find any snakes – good thing you went in armed, you can never be too sure! Lovely pics of the walks, must put that on my ‘to do’ list. Love the car parking distance guide – my personal favourite is the car that double parks you IN to the curb (just to get the bread or a packet of cigarettes)…ahhh memories….! Complimenti a Batfink! I bet you were glad of his help. I haven’t seen pitta in Italy (yours looked v professional) but do they have piadine down in the deep South? Hi!!! Batfink thanks you. I think next time I’ll make him come on the walk! 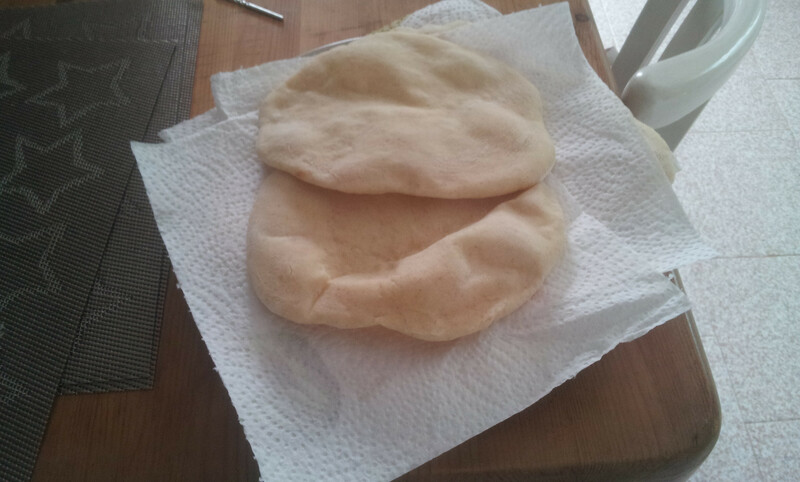 My pitta’s were alright – annoyingly too big to fit in the toaster to heat up a bit but otherwise, a success! I’ll have to try them on the neighbours. I’ve just had a piadina for lunch as it happens! There don’t seem to be much in the way of piadina restaurants that sell them here around Sarnano unfortunately. There’s such a good quick lunch! I find that as the bread is of variable quality (how’s that for an euphemism?) locally, piadine are an excellent alternative. They sell them in the local shops ready to heat up.